Getting natural probiotics can be difficult if you are lactose intolerant. While there are some lactose-free yogurts on the market, many contain genetically modified corn starch, high-fructose corn syrup and tons of sugar. You could just take a probiotic capsule, but it’s much better to obtain your gut-balancing nutrients directly from nature. If you want to expand your diet to include more natural probiotic foods instead of taking a pill, there are many, healthy options that can keep your gut balanced and working properly. Probiotics are good bacteria that help rebuild the pH balance in our bodies, keep our digestive system unclogged, and boost our immune system. When we take antibiotics because we are sick, or if we expel a lot of junk from our trunk due to diarrhea, we need to replenish our intestinal flora with good bacteria. The tastiest and healthiest way to do so is to eat foods that will support our tummies and fill them up with goodness. Probiotics can also relieve stomachaches and gas. Here are some probiotic-rich foods that are safe for those with sensitive bellies or who are lactose intolerant. Although sauerkraut sounds exotic, it is simply pickled cabbage and can be made by massaging salt onto shredded cabbage and allowing it to ferment. Some packaged varieties are pasteurized, which may damage the probiotic enzymes. That’s why it’s often best to purchase raw sauerkraut or make it yourself. While many pickles are brined with vinegar, the fermented variety can help you build good bacteria. Pickles are a simple and affordable way to stay regular. Kimchi is a popular Korean fermented vegetable side dish that is packed with flavor from garlic, chili peppers, vinegar and salt. Try it in soups or salad to kick up your weekly menu and sneak in that good bacteria. Cultured vegetables can be bought in stores or made at home the same way sauerkraut is made. You can enjoy them as is or mix them into a dish. A surprising source of probiotics is green peas. They contain leuconostoc mesenteroides, a strain of probiotic bacteria that can help boost your immune system. Kombucha tea has become widely popular among the health community, though it has been around for over 2,000 years in Japan. Kombucha tea is made by fermenting black tea with a symbiotic colony of bacteria and yeast, or SCOBY. Although many soy products are generally viewed as unhealthy, fermented, organic soy products are actually very good for you. Organic soy sauce is made from fermented soybeans. Tempeh — which consists of compacted, fermented soybean curds — is used by vegetarians and vegans as a natural meat replacement. Natto is even healthier, as it is the whole, fermented soybean and is often served with rice. There is a wide variety of cultured meats on the market. Foods such as corned beef and pickled sardines can be used as a flavorful way to get both probiotics and proteins into your diet. Fermented eggs are normally confused with vinegar pickled eggs. Not all vinegar pickled eggs are fermented and vice versa. Although lacto-fermentation is often used, you can use miso to ferment your eggs. Although kefir is a popular dairy probiotic-rich food, coconut kefir is also very nutritious. It is made by fermenting the coconut juice with kefir grains. It contains lower amounts of probiotics, but is a delicious substitute. You can also buy or make your own coconut yogurt. Just use a dairy-free probiotic powder and stir it into coconut cream, cover it and let it sit on your counter overnight. These plums are not your typical plums. Umeboshi plums are fermented and taste surprisingly sour and salty for a plum. You can find them in bento boxes, and they are often served with rice. Kvass is a fermented beverage popular in Eastern Europe. Although it is traditionally made with rye or barley, healthier varieties that are made from beets and other root vegetables have gained ground. Most ginger ale you find in a store is not healthy, as it contains high fructose corn syrup and artificial flavors. Natural ginger ale, however, can aid with digestion, and the ginger in ginger ale can combat inflammation. You don’t have to be limited by your lactose intolerance and sensitive stomach. There’s something for everyone! How do you get your probiotics? What are some of your favorite gut-balancing meals? Leave us your comments below. 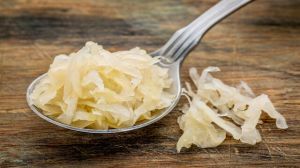 Hey Buddy!, I found this information for you: "Fermented Foods: Good Gut Foods for the Lactose Intolerant". Here is the website link: https://www.thealternativedaily.com/fermented-foods-lactose-intolerant/. Thank you.